Husqvarna TS342 Ride on lawnmower Northern Ireland for 2018. The Husqvarna TS342 is an efficient and versatile garden tractor that gives the user the choice of side discharge or mulching the clippings. 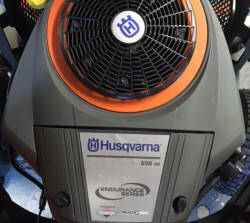 The Husqvarna TS342 features a high-specification Briggs and Stratton 656cc fully pressurized twin cylinder engine that provides smooth power when needed. This tractor lawnmower is suitable for large areas and comes fitted with a large 42 inch twin blade cutting deck with side eject. The Husqvarna TS342 ride on lawnmower is equipped with hydrostatic transmission, giving the user effortless control in forward or reverse. This ride on lawnmower is ideal for customers who have no desire to collect their clippings, eliminating unsightly mounds of grass. 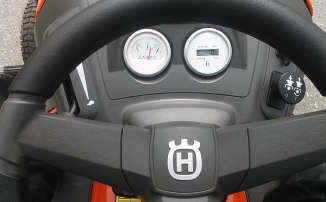 This Husqvarna TS342 for sale from AM Rentals Northern Ireland also comes fitted with a tow hitch, making this ride on mower a very versatile garden machine that can be used all year round. This model comes with all the extras you could need, cruise control, massive front bumper for protection, keyless starting and LED headlights all come as standard. 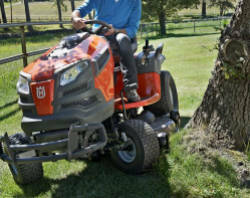 Husqvarna TS342 ride on lawnmowers, high specification at a budget price, made in USA. 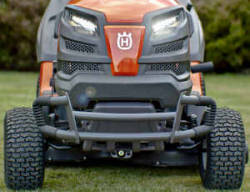 The Husqvarna TS342 mower comes with a Briggs & Stratton engine v twin engine..
Hydrostatic Transmission. no gears or clutch. Full range of accessories available as extra. All metal panels including the bonnet, with steel hinges. 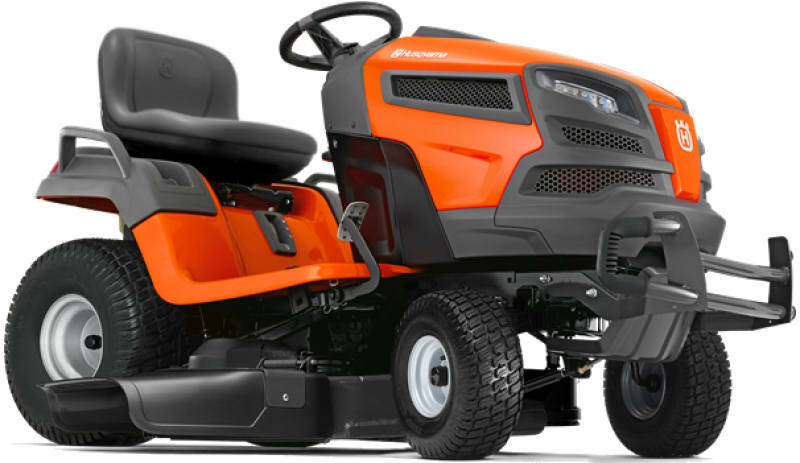 The Hisqvarna TS342 has the full size chassis, no shortcuts. Solid cast iron front axle. 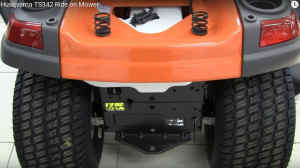 Extra wide 20inch rear tyres for more grip.